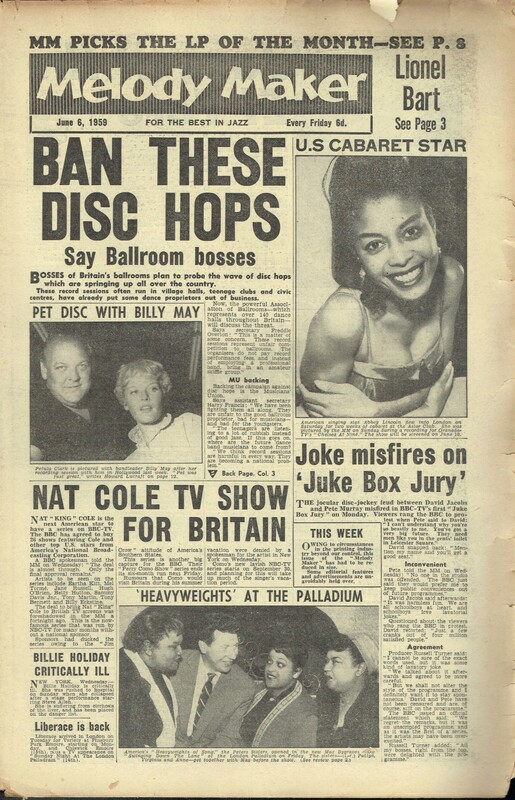 Melody Maker was a British weekly music magazine, one of the world’s earliest music weeklies, and—according to its publisher IPC Media—the earliest. It was founded in 1926, largely as a magazine for dance band musicians, by Leicester-born composer, publisher Lawrence Wright; the first editor was Edgar Jackson. In 2000 it was merged into “long-standing rival” (and IPC Media sister publication) New Musical Express. Originally the Melody Maker (MM) concentrated on jazz, and had Max Jones, one of the leading British proselytizers for that music, on its staff for many years. It was slow to cover rock and roll and lost ground to the New Musical Express (NME), which had begun in 1952. MMlaunched its own weekly singles chart (a top 20) on 7 April 1956, and an LPs charts in November 1958, two years after the Record Mirror had published the first UK Albums Chart. From 1964, the paper led its rival publications in terms of approaching music and musicians as a subject for serious study rather than merely entertainment. Staff reporters such as Chris Welch and Ray Coleman applied a perspective previously reserved for jazz artists to the rise of American-influenced local rock and pop groups, anticipating the advent of music criticism. On 6 March 1965, MM called for the Beatles to be honoured by the British state. This duly happened on 12 June that year, when all four members of the group (Harrison, Lennon, McCartney, and Starr) were appointed as members of the Order of the British Empire. By the late 1960s, MMhad recovered, targeting an older market than the teen-oriented NME. MM had larger and more specialised advertising; soon-to-be well-known groups would advertise for musicians. It ran pages devoted to “minority” interests like folk and jazz, as well as detailed reviews of musical instruments. A 1968 Melody Maker poll named John Peel best radio DJ, attention which John Walters revealed may have helped Peel keep his job despite concerns at BBC Radio 1 about Peel’s style and record selection.